Jonny Bairstow fell two runs adrift of a century as England’s batsmen completed their preparations for this month’s first Test against the West Indies. After helping themselves to 19 wickets on Wednesday the tourists ended their second full day of batting against a CWI President’s XI on 379 for 10, with Bairstow narrowly missing out on the first ton of the trip and Rory Burns adding 68. Yorkshireman Bairstow, who scored a fine hundred at No 3 in England’s previous Test in Colombo and will take up the same slot in the coming series, hit 10 fours and two sixes in a confident innings lasting almost two-and-a-half hours. His crisp timing and willingness the force the tempo leave him well placed going into the meaningful contests ahead, but he missed out on the psychological boost of reaching three figures when he was caught deep on the leg side off Raymon Reifer. 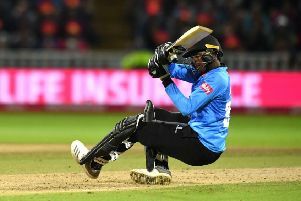 Reifer, one of two full internationals in the home attack along with Miguel Cummins, also dismissed Keaton Jennings and Jos Buttler in single figures as he did his bit for the Caribbean cause. Jennings will be particularly disappointed not to make his mark, with questions lingering over his long-term prospects at opener despite a highly impressive 146 not out in Galle two months ago. The Lancashire batsman’s Test average sits at a modest 26.62 after 15 caps and, after being dismissed for 10 in his first knock of the tour, he was pinned lbw for just seven here playing an indeterminate stroke. Joe Denly, the spare batsman on tour, missed his chance to add further pressure on Jennings when he was clean bowled by Chemar Holder for 12 and a debut for the Kent man continues to look a distant prospect. Buttler, captaining in the absence of rested Yorkshire bat Joe Root, nicked to slip for three and will head into the series opener having spent just 14 balls in the middle. Yet, after a consistent 2018 and a successful recent stint in Australia’s Big Bash League, his readiness is of no real concern. While Bairstow’s demeanour on a sluggish pitch was comfortably the best of the day, Burns also left a strong impression. The Surrey skipper is still awaiting a major score at the highest level, with a best of 59 in his first six attempts, but he has looked the part and set up nicely at the 3Ws Oval. He took only 65 deliveries to post his half-century, reaching the landmark with a hearty pull, and scored at a brisk rate throughout before being stumped off the gentle spin of Bryan Charles. England’s lower order chalked up some useful runs in a low-key evening session, Sam Curran throwing the bat for his 47 while Chris Woakes (43) and Yorkshire’s Adil Rashid (48) enjoyed themselves late on. Gordon Hollins has been appointed as the England and Wales Cricket Board’s first managing director for county cricket. Nick Gubbins, Stephen Eskinazi, Tom Helm and Max Holden have signed new long-term deals with Middlesex.